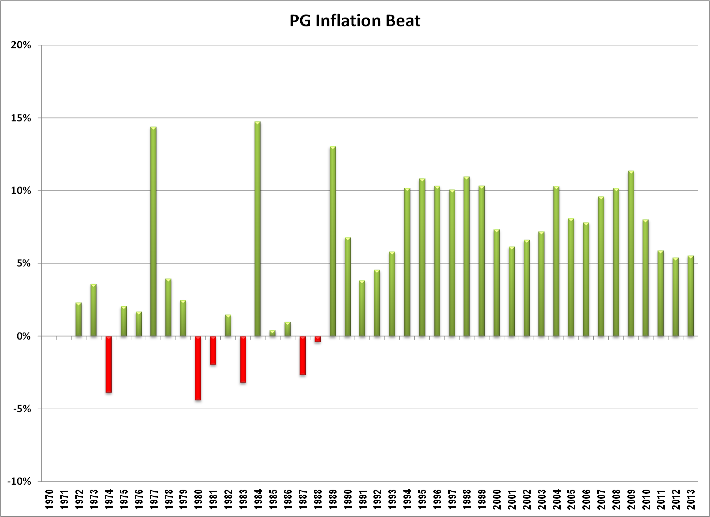 Is DGI the Perfect Answer to Inflation? » Is DGI the Perfect Answer to Inflation? Finding an investment product that can provide an income and at the same time continually rise to exceed the inflation rate is a primary goal for many retirees or soon to be retirees. Finding such a vehicle is a daunting task. Fixed Income (bonds, preferred stock & fixed annuities) while low risk, operates just as it names describes. They provide a fixed income over time with no increases. It is predictable but cannot combat inflation. 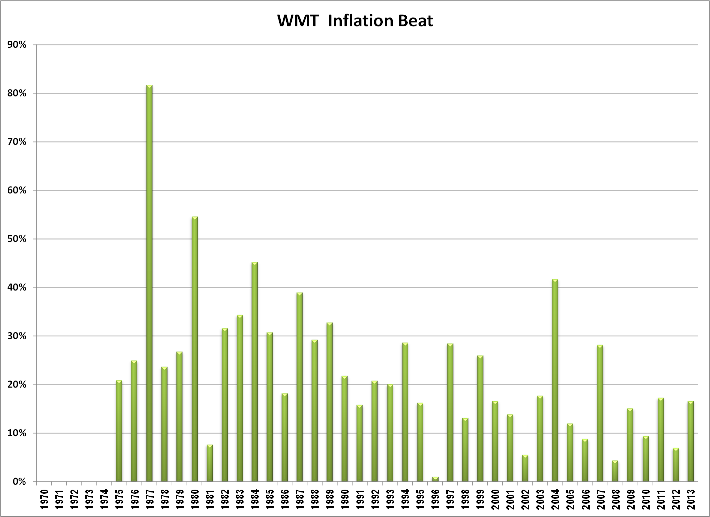 Note: Considered posting graphs for all stocks but that would have made this post pretty busy so instead contrasting graphs of PG & WMT will be used. If anyone would like the data for the other stocks leave a post and it will be provided. While not perfect, DGI is pretty darn effective! Though one could argue that the years that they did beat inflation, the dividend growth exceeded the inflation rate by such a large amount that it compensates for any one-time loses giving your long term growth rate a positive factor and this is a sound statement. But, what if your income did not meet or was just meeting your expenses at the start of retirement? You may have been planning on that growth from the start and the years you do not beat inflation could hurt. With people living longer it is not unreasonable to assume a 30 year retirement of which there will be 3 times during that period where income growth will fail to beat the inflation rate. While DGI is extremely effective it is not a 100% solution. Question now is; are their alternatives that can reduce the risk? The two REITs dividend growth also failed beat inflation once every 8 years but that 8 year cycle was completely different. When our basket of stocks failed to match the inflation rate REITs beat it and vice-versa. Another factor discovered is the amount they failed to beat the inflation rate was much lower on average; -1.3% versus -5% for our basket of stocks. By diversifying with REITs we reduce risk and spread losses out over different years leading to the conclusion that some REIT positions are necessary components for DGI. Are there other alternatives? Most likely…wish to share? I'm willing to listen & learn.